Prince Albert II of Monaco married former South African swimmer Charlene Wittstock on 1 July last. The wedding took place over two days: the civil marriage ceremony on 1 July 2011, followed by the religious ceremony on 2 July 2011 at the Royal Palace by the Mediterranean sea. Up to 3,500 guests, from French President Nicolas Sarkozy to the heir to the Spanish throne, as well as fashion designer Karl Lagerfeld and supermodel Naomi Campbell, attended the lavish celebrations in Monaco afterwards. Prince Albert II, 53, has been the ruler of Monaco since the death of his father, Prince Rainier III, in 2005. Charlene Wittstock represented South Africa at the Commonwealth Games before competing in Sydney as part of the women's medley relay team that finished fifth in the final. 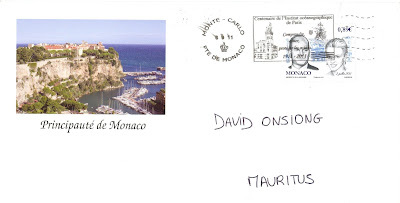 The slogan postmark reads: Centenaire de l'Institut Océanographique de Paris. Comprendre, aimer, protéger les océans. 1911-2011.